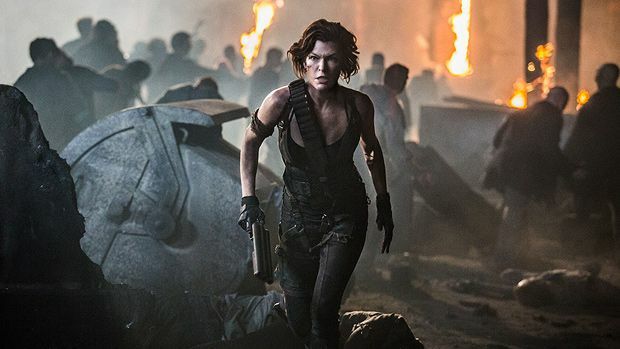 All the Resident Evil films pass the Bechdel test with flying colours, in that they all feature at least two (named) women who speak to each other about something other than a man. It's not an indicator of quality but this sixth, and purportedly final, instalment in the video game-inspired franchise is enjoyably barmy and energetic as it battles on furiously in the never-ending fight against the dastardly Umbrella Corporation and swarms of the walking dead. Milla Jovovich stars as the indefatigable Alice, in a film helmed by her British husband Paul WS Anderson (the two met on the original back in 2002 and have worked together on all the follow-up films, with Anderson writing / producing all six parts and directing four). This time she returns to Racoon City to wreak revenge on the malevolent Wesker (Shawn Roberts) and release an airborne cure for the T-virus. Setting off from a ruined Washington DC she is eagerly tailed by the evil Dr Isaacs (Iain Glen, growling out evangelical speeches in an assortment of roll neck jumpers), who does his very best to stop her from completing her mission. From the very start the focus is on CGI-enhanced action, with Alice crushing zombie beasts and hilariously crashing every vehicle she steps into. She gets to zipline out of a burning building and catapult fireballs from a nifty contraption designed by a new addition to her crew, Abigail (Ruby Rose). Anderson's combat sequences bear a striking resemblance to the war scenes from the Lord of the Rings trilogy, and Alice's journey back to the Hive takes its lead from the visual spectacle of Mad Max: Fury Road. In its imitation, The Final Chapter unapologetically declares a love for bold and brilliantly realised action. It never succeeds in reaching the lofty heights of those it emulates but remains brutally executed, throwaway fun. General release from Fri 3 Feb.